We recently purchased a home in the South Land Park Hills area on Fordham. 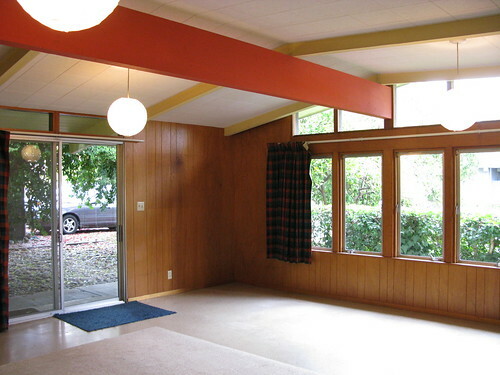 I understand that less than 60 Eichler homes were built here in Sacramento. If you have any intel, artifacts, pictures, stories, ephemera, etc. regarding the history (past to present) of the South Land Park Hills tract, I would love to hear from you. your model is one of my favorites. looks like you have a few projects ahead, but will be well worth it. You have a great house to start with. Luckily, if you choose to restore it properly, replicating original details is much easier today than it was 5 years ago. is this the old garage or carport? Thanks Joe! The rumpus room is indeed where the former garage used to be. Our restoration will be slow and steady. The former owners took great care in keeping the original details and so will we. My wife and I lived in our bank repo Cliff May for a year before we did anything. We originally had plans to add on, but the longer we were in the house, the more we liked the original design. Restoring original ended up being the least costly route. I look forward to following your progress. Usually this board has answers to questions. sometimes too many answers. The search function is great for finding old threads on popular topics. If you're ever stumped, feel free to shoot me a message.